I was never that little girl growing up dreaming about what my wedding would look like. Of course, I dreamed about who my husband would be, and no lie I thought about my wedding shoes. I always wanted to get a pair of designer shoes for the occasion. I mean after all, if you can’t splurge on your wedding day then when can you? For my birthday every year my Mom and I take a trip to Phipps Plaza and Lenox to shop the after Christmas sales. There are always a ton of designer shoes on sale, so with a wedding in mind, we browsed them all hoping to find a great deal on a designer pair I’d love to wear on my wedding. Most of the options we found were a little too high fashion for me (here’s a visual… haha!). On our way out, I thought I’d make one last look in Jefferys, a store I’ve never been in. A sparkly pair of shoes caught my eye, and even though they were in my wrong size section I decided to look at them anyway. Turns out, they were in my size and marked down 50%. Mom and I felt like it was a Cinderella moment, and I knew I found the perfect heel to walk down the aisle in. Although a part of me was scared for my little feet making it all day in them 😉 I was so happy to find them with my Mom, because our favorite thing to do together is shoe shopping. We wear the same size and always share our closets. I know no one else will see them on, but to me, it was totally worth the splurge. I really wanted all the pretty shoe shots I constantly pin on Pinterest. I knew I wanted a shoe I could wear again on special occasions, so I didn’t really want anything satin because it seems too formal for date night. It depends on your personal style, but I’m a girly girl at heart and will have no problem wearing a little sparkle on my feet with jeans! The same birthday Tim gifted me these Keds to wear because he knew I wouldn’t last in heels all night, and my wobble would have probably been sub par if I tried to stay in them and I couldn’t have that! . 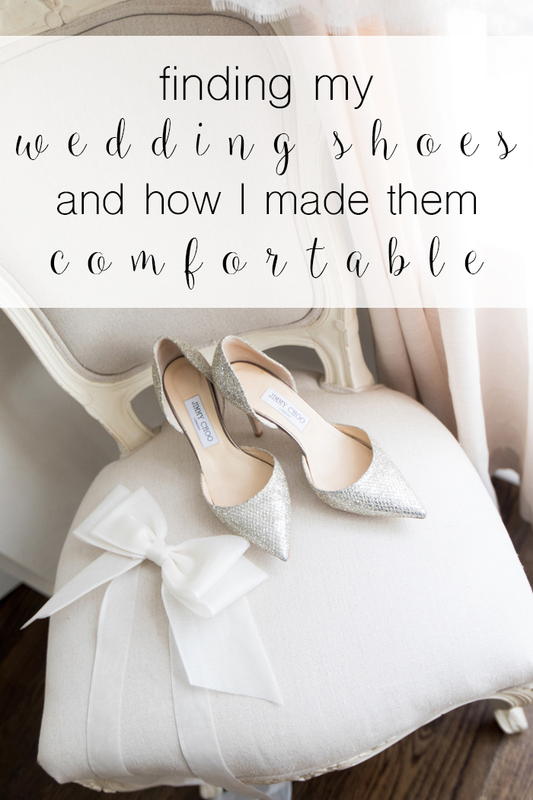 Today I wanted to share a few quick tips I used to get a few extra miles in your wedding shoes so you can pick the shoes of your dreams and not worry about your feet. Wear them around the house daily starting a few weeks before your wedding. I would put them on while vacuuming or cleaning around the house to gradually get my feet used to them. Like I needed an excuse to pull them out 🙂 I wouldn’t wear them outside because you want to keep them clean. I wanted to widen my shoes a bit because I was #blessed with a bunion, so I slipped on socks while I walked around the house in them. It worked like a charm after only a few wears! After wearing them around the house, you’ll be able to notice certain spots that continue to hurt / blister / turn red. You can apply a little moleskin to these areas to add a barrier to these sensitive spots. Of course, if you have strappy shoes this will be more difficult to conceal, so if you don’t want to get creative with your scissors you can also try a little deodorant to these areas so add a little barrier between the two. I’d also recommend adding in a sole cushion, but make sure your feet have enough room with all these new additions! Depending on your shoe you may want to wait until after the pretty pictures are taken before adding your protective layers. I purchased these to protect my heels in the grass, but I didn’t even make it out the door with them on because they kept popping off. At that point I was getting frustrated with a few things (you can watch my wedding day vlog here), so I remember throwing it somewhere and not using them 🙂 I’m not sure if I didn’t apply them the correct way or not, but they obviously were not helpful to me. You do need to consider the hem length of your dress if you’re going with this option, but I was changing into a shorter dress to dance in any way. I changed into my Keds for the garter toss to give them a little spotlight, then changed into my reception dress to get to dancing comfortably. I didn’t have to use it, but I did purchase and bring some in case my bridesmaids or I needed it that night. I’ve heard it’s the same ingredients inside Sole Serum, and it’s a fourth of the price on Amazon. You can check out my wedding Pinterest board here to see all of my inspiration. It was so fun pinning and dreaming up ideas when I was first engaged, but let that go once you get deep into planning or else you’ll be changing your mind and adding too many last minute details to your plate. Those are seriously THE perfect wedding shoes! So many beautiful shoes for a wedding! I love the ones that you chose! 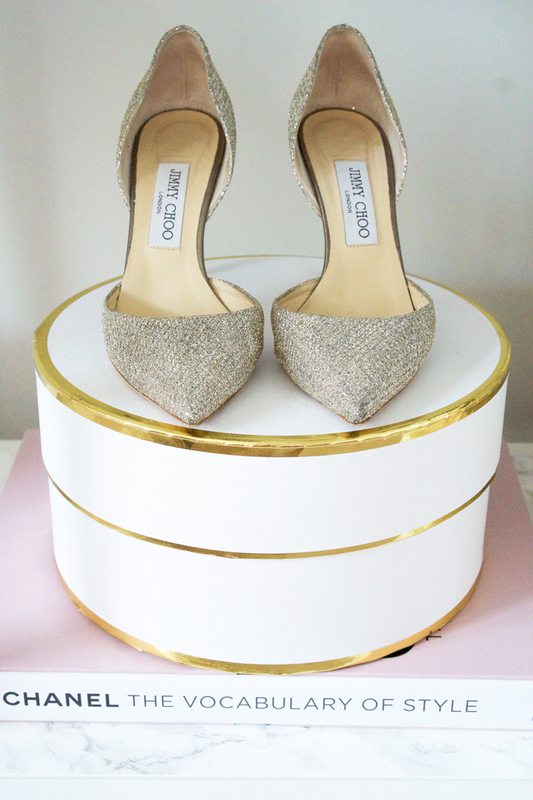 The most perfect pair of wedding shoes!!! I don't think I will ever be able narrow it down to one pair! These shoes are gorgeous!! 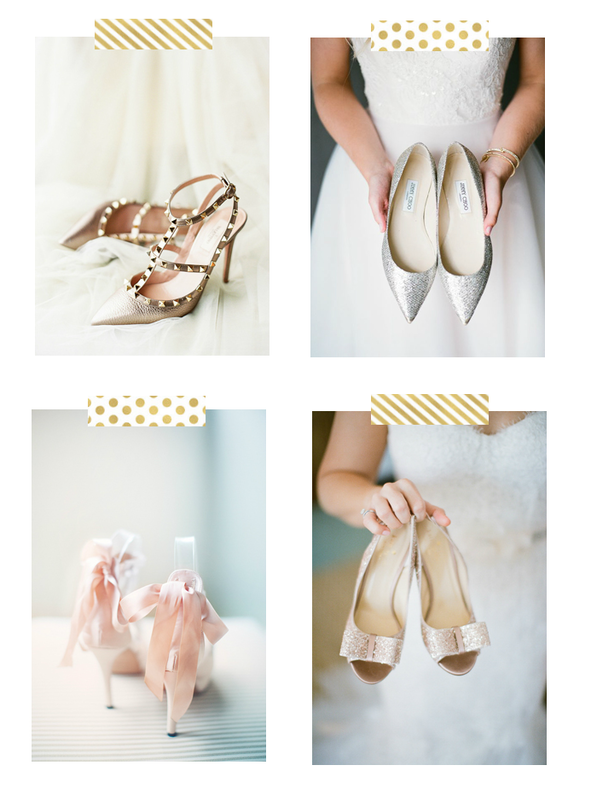 I wish I had followed these tips when I was picking out my wedding shoes! Wow, these are such gorgeous options! I just bought the first pair I saw but totally wish I would have put more thought into it! These shoes are beautiful! I bet they were perfect for the big day! These are such great tips! I had my wedding shoes stretched before the big day and it was totally worth it. Yours are absolutely beautiful! Love these tips!! I didn't know that about aspercream and how it's way cheaper than sole serum! Def have to try. Those shoes are perfect wedding shoes! Love them! These are so pretty – perfect for a wedding! That sock trick is genius!! These shoes are gorgeous, love these tips!